Elegant and fitted with the most desirable comforts, the style and furniture in the rooms of Villa delle Palme create that atmosphere of age-old, noble Venetian buildings. 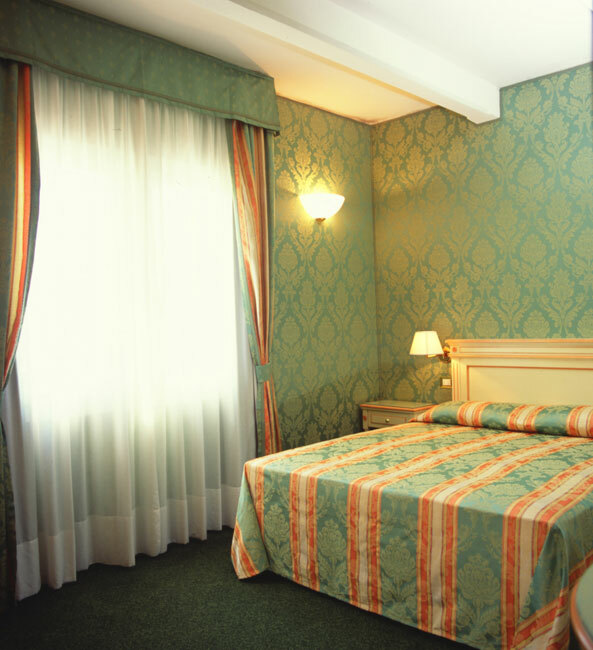 In relaxing shades of green, with soft carpet and special sound-proof silk tapestries, the rooms are all new and fitted with adjustable air conditioning (hot/cold), minibar, telephone with direct outside line, Internet link via ADSL or analog connection and satellite TV. All rooms are en-suite with a bidet, shower and hairdryer; each comes with complementary shampoo, shower gel and soap. 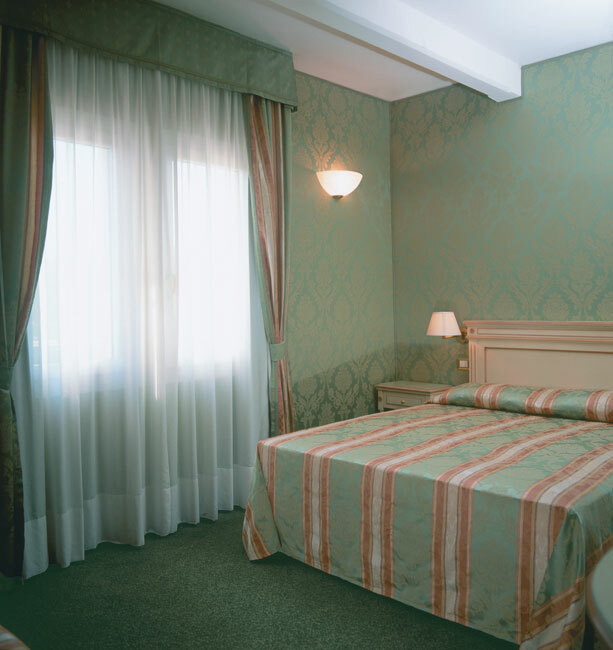 The rooms of this hotel in Lido di Venezia have big windows, with mirrored, double glazing and special filters to lessen the reflection of the sun, without reducing the light entering the rooms. Heavy curtains ensure complete darkness at night. Three rooms overlook the private terrace, furnished with seats and tables. 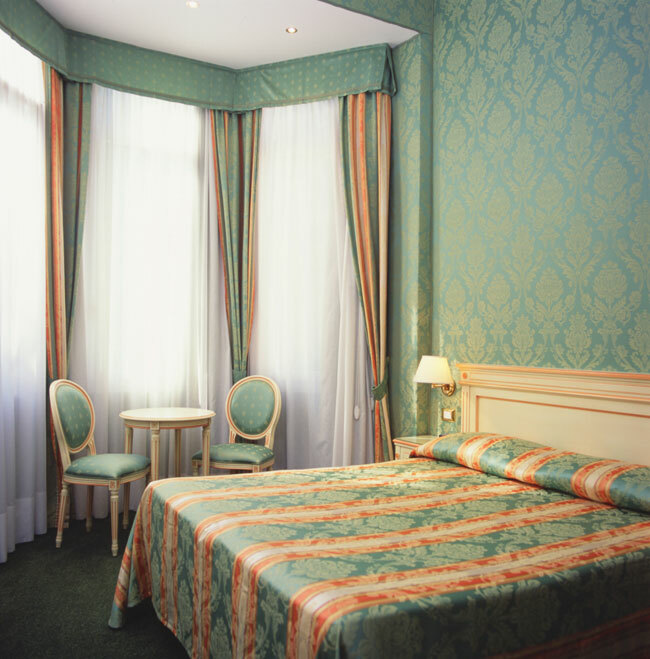 Silence and calm is ensured in all rooms as the hotel is located in a particularly quiet area. Room service is available on request at a small extra cost. 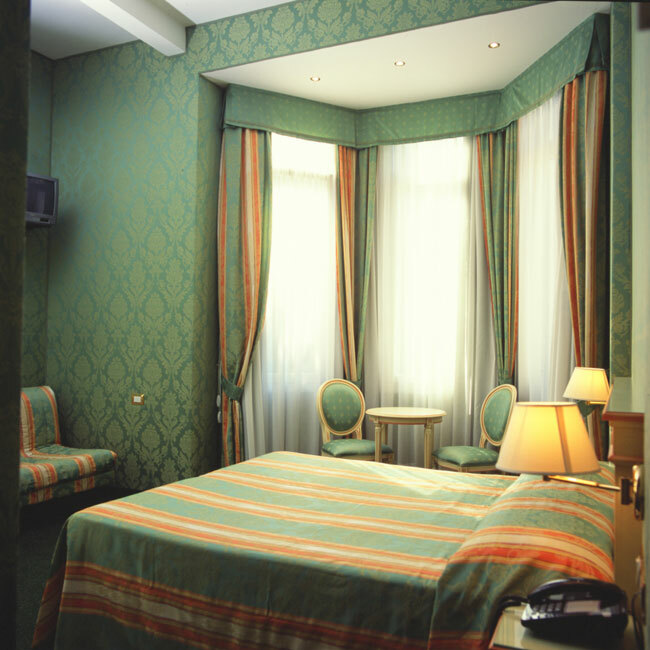 Splendid rooms for three people, perfect for a family vacation or holiday with friends. Rooms for three people, perfect for a family vacation or holiday with friends. * Free! All children under 2 stay free (if they share a bed with their parents). * All children under 2 pay 10 EUR a night (if a crib is reserved). * Only one crib allowed per room. * No other bed can be put in the room. * Any type of additional bed or crib is available upon request. The hotel must confirm availability. * Additional beds are not included in the room price and must be paid for separately at the hotel.